Shipping costs are automatically added to your order since there is a significant cost to providing proper live animal shipments and such costs can significantly vary between alternate destinations. To get a shipping quote, add the desired product to your cart, view your cart and select "Calculate Shipping on the Cart page. If not ready to buy, you can simply select "Empty Cart." Also, if you are close to our Wimauma location, we can coordinate with you on a location for pickup. This option is applied by using the coupon code "PICKUP" on the Cart page. Redfoot Ranch ships all of our live animals via FEDEX Priority Overnight for delivery on weekday mornings (shipments initiated on Monday-Wednesday for deliveries on Tuesday-Thursday). Note that our standard delivery schedule avoids Thursday shipments (Friday deliveries) since, should a delay occur, delivery would not occur until Monday. It is important that someone be available to receive the live animal deliveries at the time of delivery. If you are unable to support these delivery arrangements, please contact us regarding the possibility of a weekend delivery as well as the added fee that would be required. Redfoot Ranch will contact you by phone and/or email before shipment to confirm that you will be available to receive the package when it arrives. We will also provide you with FEDEX tracking information. Also, please notify us by phone or email if you need to delay shipment for any reason. You may, for example, be in the process of establishing a proper enclosure for the animal(s) and, as a result, need to delay shipping. You also might need to delay shipping because of your availability. It is the customer's responsibility to assure that someone is there to receive the package at the time of delivery by FEDEX. Redfoot Ranch carefully packages our live animal shipments in specially designed boxes lined with high quality styrofoam. We also utilize heat packs or cool packs inside the boxes when necessary to help maintain an appropriate temperature. Prior to shipment, we will assess weather conditions and other information and will not initiate any shipment that we feel could be unsafe for the animal(s). Redfoot Ranch reserves the right to withhold shipment if, in our judgment we feel that shipment would be unsafe. In the event that a customer notifies Redfoot Ranch that a delayed shipment would not meet their needs, Redfoot Ranch will issue a full refund for their order. Minor product variations from the descriptions provided on our website are possible. For example, minor differences in age or size may exist between website descriptions and the delivered animals. Photos displayed on our website may or may not be of the exact animal that you purchase. Redfoot Ranch will not provide refund or replacement based on any minor variations. 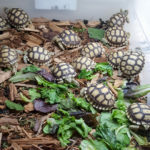 Redfoot Ranch warrants that our captive bred animals will survive through shipment. Please note that this warranty does not apply to wild caught animals and does not apply in the event of shipping delays or mishandling. 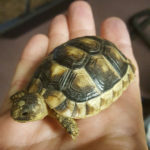 In the unlikely event that an animal is DOA, the customer is responsible for informing Redfoot Ranch within an hour of delivery by providing us with an email with a photo of the animal as proof. For this purpose, the delivery time is determined based on the FEDEX delivery confirmation for the shipment. 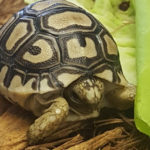 A warranty for our captive bred animals is also provided if, within seven days of receipt, they do not eat and act normally when they are properly cared for. 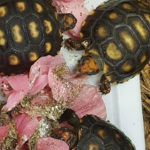 In such cases, the customer must provide a timely notification to Redfoot Ranch of the issue (within the same day as the occurrence) and must provide an adequate response should Redfoot Ranch request evidence of a deficiency including, if requested, freezing the dead animal for return to Redfoot Ranch. For covered warranties, Redfoot Ranch will, at our discretion, offer a product replacement or refund of the purchase price. We do not provide a refund for shipping cost and the customer will be responsible to pay shipping cost of a replacement. State and Local Regulations - Redfoot Ranch will not knowingly break any laws in conducting online sales or shipments. It is the responsibility of the customer to be cognizant of and comply with any local or state regulations. 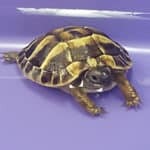 Note that tortoises and turtles under 4" are offered by Redfoot Ranch for scientific or educational purposes only. Redfoot Ranch will cancel any sale that is known by Redfoot Ranch to be subject to legal restrictions.